So, I just finished watching the series finale of Dexter. I am emotionally spent. I just spent the last 55 minutes with my jaw clenched and my heart racing. I know that Dexter is not for everyone (it is weird to root for a serial killer), but I happened to have loved that show. I have some serious thoughts about the finale, but will spare you in case you have not watched it yet. I would hate to be a spoiler. Let’s just say that I am 90% happy with how they wrapped up the show. One of my favorite things to do is to recreate recipes that I eat in restaurants. Sometimes I get pretty close, but sometimes I just take the idea and make my own version. This salad idea comes from Red Rocks Bistro in Old Town. They have the best lunch deal in town, and sometimes the kids and I go there on Monday when they have their weekly half day. I love their beet and orange salad so much. There’s has cumin in the dressing and some chives, I had neither of things when I decided to recreate it, but parsley added the freshness that it needed. 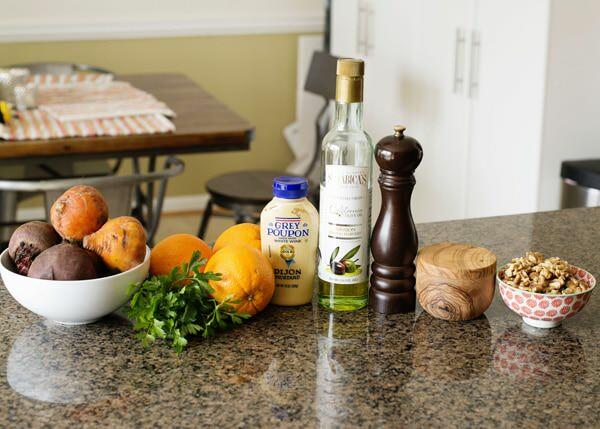 You could always add a little cumin to this dressing if you wanted to. This salad can be made ahead of time and just gets better the longer that it sits. You can leave it in your fridge and snack on it all week. 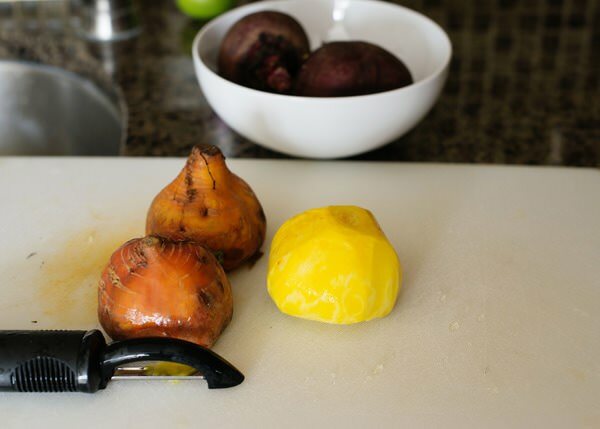 Peel the beets with a vegetable peeler. I use kitchen gloves because the red ones will stain your hands. Cut the beets into small cubes. 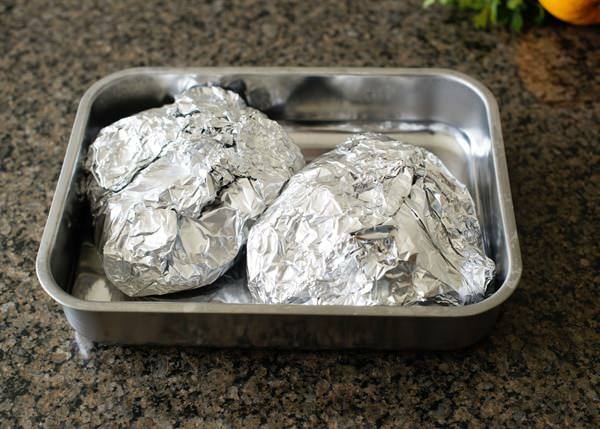 Fold a large piece of aluminum foil in half. 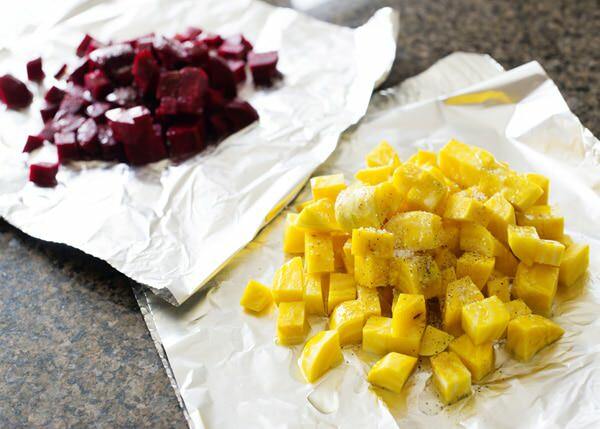 Put the beets in the middle of the foil. I don’t want the colors to bleed, so I do two separate pouches. Drizzle with olive oil and season generously with salt and pepper. Fold the corners of the foil together, and pinch the pouch shut. Put the pouches in a pan, just in case they leak. Bake in a 400 degree oven for about 25 to 35 minutes. While the beets are roasting, segment the oranges. Cut off the bottoms of the oranges so they do not roll on the cutting board. 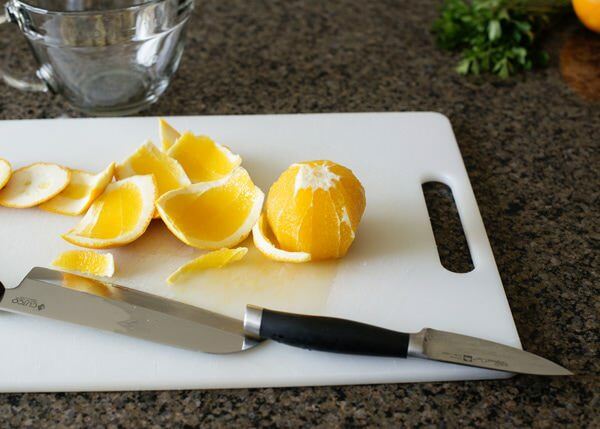 Using a sharp paring knife, start at the top and work your way down removing the peel. Hold the peeled orange in your hand, and carefully cut the flesh out between the membranes. Add the segments to a bowl and squeeze the juice from the orange. 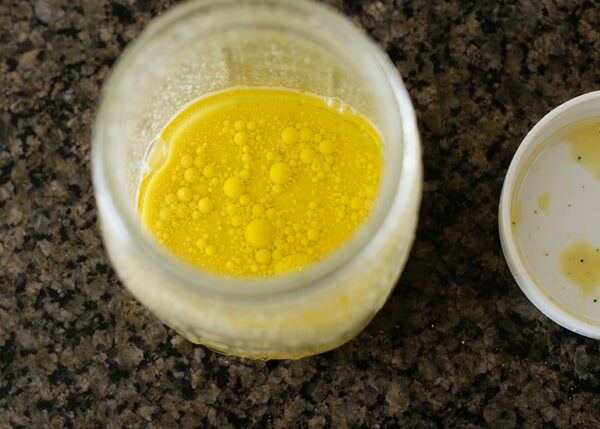 Add 3 Tablespoons orange juice, Dijon, vinegar, salt and pepper to a mason jar. Screw the top on and shake. 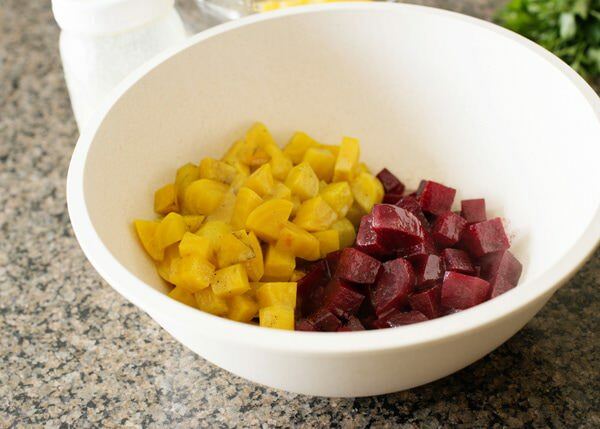 Add the roasted beets to a large bowl. Add half of the dressing and toss to combine. Add orange segments, walnuts, and parsley. Taste for seasoning. Add more dressing, salt, and pepper as needed. Wearing a pair of gloves, peel the beets with a vegetable peeler. Cut the beets into small cubes. Fold a large piece of aluminum foil in half. Put the beets in the middle of the foil. I don’t want the colors to bleed, so I do two separate pouches. Drizzle with olive oil and season generously with salt and pepper. Fold the corners of the foil together, and pinch the pouch shut. Put the pouches in a pan, just in case they leak. Bake in a 400 degree oven for about 25 to 35 minutes. While the beets are roasting, segment the oranges. Cut off the bottoms of the oranges so they do not roll on the cutting board. Using a sharp paring knife, start at the top and work your way down removing the peel. Hold the peeled orange in your hand, and carefully cut the flesh out between the membranes. 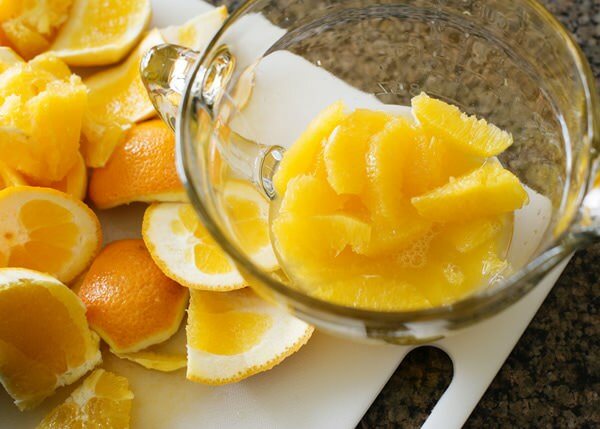 Add the segments to a bowl and squeeze the juice from the orange. 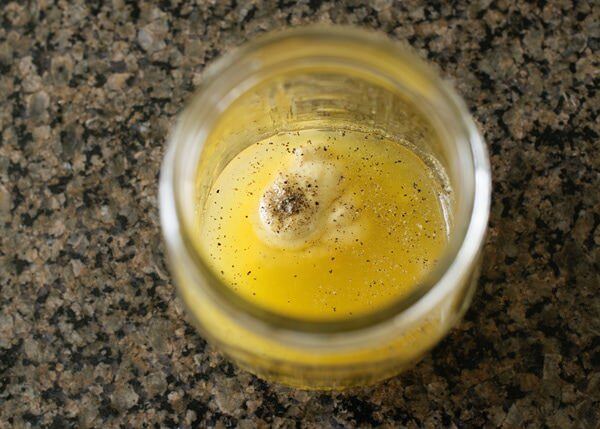 Add 3 Tablespoons orange juice, Dijon, vinegar, salt and pepper to a mason jar. Screw the top on and shake. Add the olive oil and shake to combine. 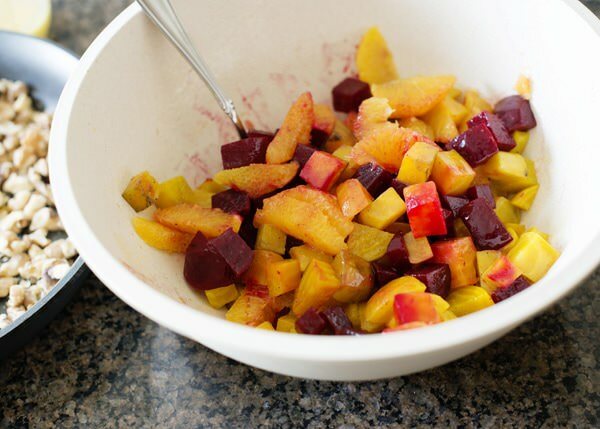 Add the roasted beets to a large bowl. Add half of the dressing and toss to combine. Add orange segments, walnuts, and parsley. Taste for seasoning. Add more dressing, salt, and pepper as needed. Great recipe. Looks fab, and yes wearing gloves so key with beets! thank you Liz! And yes, gloves are a must. What? That is is my favorite way to eat them, they get so sweet. I love Dexter but I was so sad that deb died and he abandoned hannah and harrison! I was trying not to spoil it for anyone. You are welcome! They are super easy to roast. Just be careful, or your hands will be stained. Ahhh, I haven’t watched the last episode of Dexter yet but I CANNOT wait to know what happens! So anxious. Hahha! I didn’t even think about it! We could have used those for the opening sequence. Oooo, we can talk Dexter as soon as I catch up! it was a hard sell for me but once i got over the icky serial killer thing, i really liked it. your photo above is absolutely gorgeous! it almost makes me want to try beets again, and that’s saying a lot! any suggestions for food photography books, websites or tutorials? Thank you Annie! I like Matt Armendariz’s book and Plate to Pixel. This salad is positively stunning! I don’t think it’s possible for my to love this salad any more. Wow! Putting this on my must-make asap list. No seriously, I just ordered kitchen gloves on Amazon. I’m serious about this. I use them for everything! I like to use them to roll meatballs. BUT, I’m wondering if you could be a little more specific with your measurements. 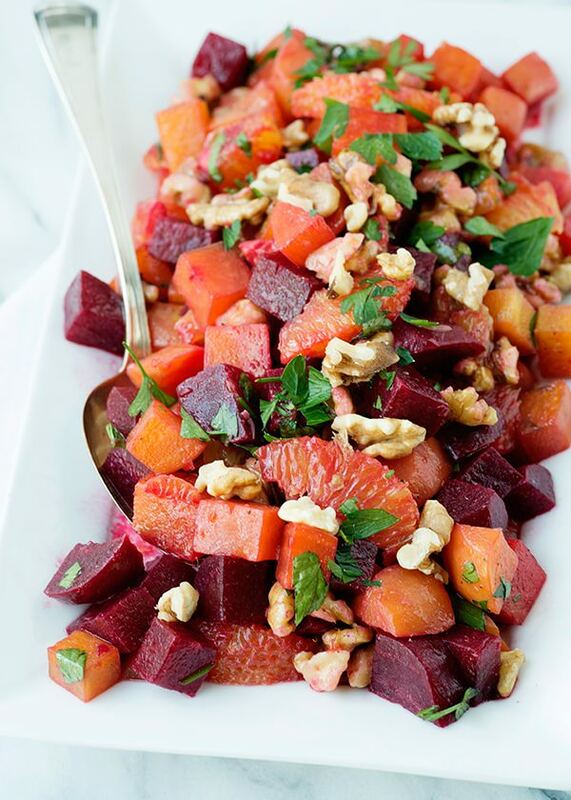 The size or number of beets in this recipe wouldn’t really matter as the amount of dressing can be adjusted. Large boneless chicken breasts, on the other hand, can be twice the weight of smaller ones. That does make a huge difference in both the amount of liquid and seasonings needed, as well as cooking time. Also, cans (of green chiles, for example) can be 4 or 8 ounces, tomatoes 8 or 15, and so on. Just a thought! Thanks. I appreciate the suggestion. I include photos of the ingredients to clarify. This sounds like such a fabulous salad. I love beets! Me too! And I didn’t eat them for so many years, I missed out! 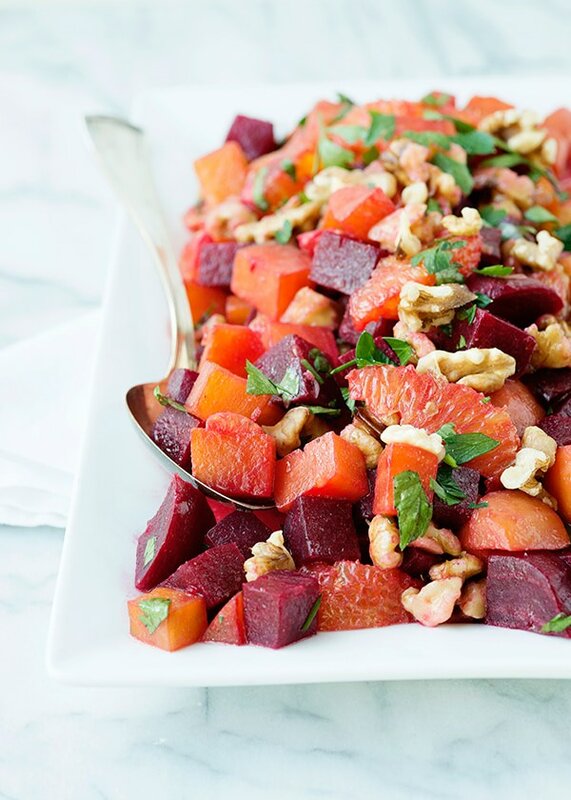 Mmm… loving all the autumn flavors in this salad!! perfect fall colors. this looks delicious and packed with nutrients! We have the same problem with Downton Abbey. Only we have to wait MONTHS! You have done it again, created a recipe I want to make. 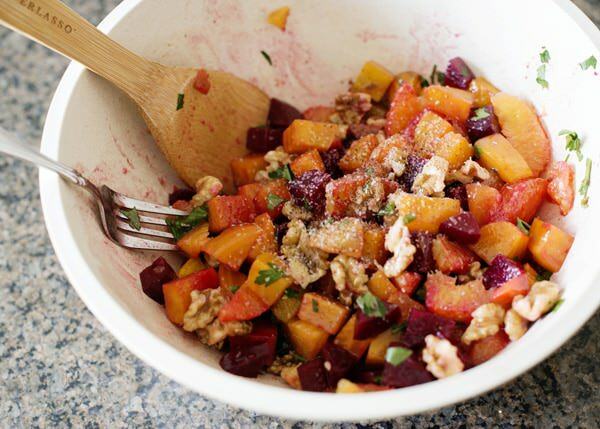 Gorgeous fall colors in this salad, and I love the play with citrus. Definitely making …… this weekend! I love beets, I’ve only made beet salad w/ balsamic vinegar, can’t wait to try it with this dijon dressing, and the parsley sounds fab. Yum, thanks for the great idea! You are welcome! I love this salad! Such a beautiful salad! Beets are slowly growing on me. I have not ever seen yellow beets. I’ll have to keep my out for them. It took me awhile too. Now I can’t get enough. This looks great! I’m so happy I stumbled upon your site it’s great! This looks yummy! By the way, if wash your hands with baking soda after peeling beets, the red comes right off your hands! I tried it and it actually works. I guess baking soda is just abrasive enough to do the trick. I got the tip from Food Network. Amazing! Thanks for the tip! I love beets! Can’t wait to try this. You will LOVE this salad then. So refreshing. Do you think you could use mandarin oranges(?canned) to make it more for the holidays?? You could, but I don’t think that they are as fresh tasting. How many beets are in a bunch? Also will this salad hold up if i make it the night before? And how many servings does it make? I have never had beets and am excited to try this! Thanks! About 3-4 to a bunch. Yes. About 4. Can you give an idea how many people this might serve? For a dinner party of 8 should I double it? Hi.. Can we used canned beetroots instead of fresh baked ones? Sure thing! Or you can use the pre-roasted in the produce section of the grocery store.